The Syncro 15 is small enough for an afternoon shred, but has enough storage for an all-day epic. The recent trend of riding without a backpack is understandable given that many packs are uncomfortable, heavy and unstable. In response, some brands have introduced clothing and systems allowing tools and riding necessities to be carried without a pack. But there's still a lot to be said for riding packs, and they remain the only option when it comes to being prepared on long rides. When I first saw Osprey's Syncro 15, I thought it looked like a child's backpack. You know–those tiny little things that only fit a coloring book, one sock and maybe a stuffed animal or two. Despite my hesitations, I gutted my current pack and swapped everything over to the Syncro 15. It was like one of those magical bags from “Harry Potter” that's bigger on the inside: I fit everything in it that I usually carry and still had room for three extra tubes, an extra jacket, food, my DSLR and lens, plus the full 2.5-liter reservoir that’s included with the Syncro 15. Smart features like a magnetic hose clip and vented foam straps make the Syncro 15 light and easy to manage. However, it would be nice to have a thicker, more comfortable waist strap. There are three main compartments: one large compartment close to the back that also holds the water bladder; a J-zip organizer with mesh pockets; and a small padded pocket on the outside for a phone, glasses or anything else you want quick, but protected, access to. I ride with more tools than most riders do, and I was easily able to fit everything in just the J-zip organizer. This left the main compartment open for extra clothes, my SAM Splint, camera and whatever else I wanted to lug around all day. Even the stash pocket holds more than it appears–I fit my GPS, phone and glasses in it quite comfortably. 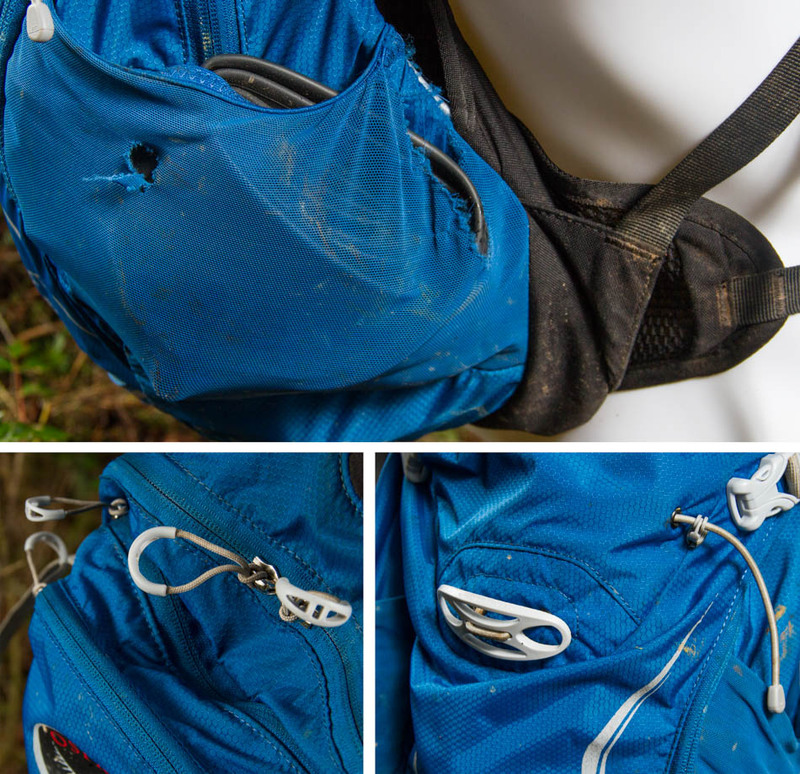 The external stuff pouches are great for items like extra tubes, but a good impact with a tree might do some damage. Luckily this is covered under Osprey’s warranty. Big pull tabs make opening the zippers easy even with gloves, and Osprey’s LidLock system is one of the best helmet-retention systems on the market. On the outside of the Syncro 15 is Osprey's LidLock helmet attachment, which is one of the best helmet-retention systems on the market–so long as you have an openly vented helmet (some MIPS- equipped helmets and the Smith Forefront helmet don't have big enough vents). There are also two side pockets on the outside of the Syncro 15 that are excellent for storing tubes or other bulky but light objects. However, the pockets are light-duty elastic and heavy objects aren't very secure in them. I lost a headlamp out of one, but haven't had any problems storing tubes, gloves, socks or other light, higher-volume items. After sideswiping a few trees, I've ripped a gaping hole in one side pocket. The damage should be covered under Osprey's warranty. 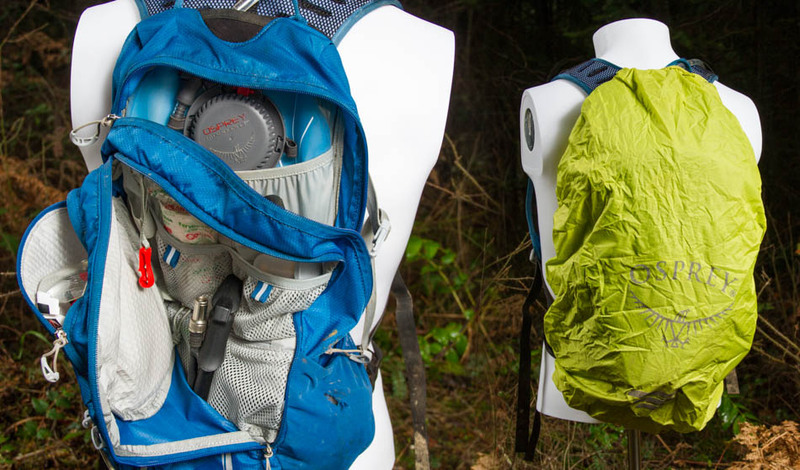 Osprey is one of the few companies that offers a lifetime guarantee for all of its packs, promising to "repair any damage or defect for any reason free of charge." 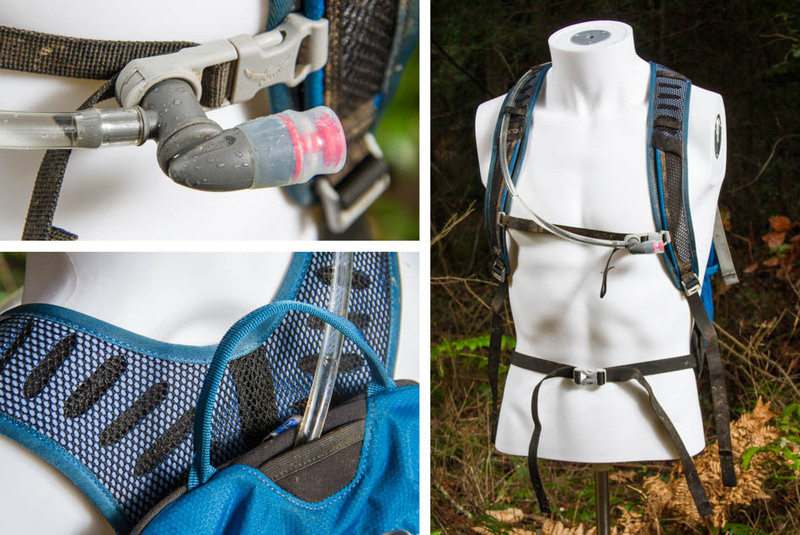 The included 2.5-liter water bladder has its own slot in the main storage compartment, while tools and other goodies are handled by the dividers in the J-zip compartment. The built-in rain cover generously covers the full pack and doubles as high visibility if you’re caught on a road after dark. When the weather turns foul, there's an integrated rain cover that provides generous coverage so you'll have peace of mind knowing that your dry pair of gloves in your pack will indeed stay dry until you need them. I've gotten some extensive use out of the cover lately and I can confirm that it will definitely keep the inside of your pack dry as a bone–even in a downpour. One of the best features of the Syncro 15 is the back panel that pushes the pack away and off your back for increased air flow. This time of year, I tend to wear a lot of clothing to keep out the cold and wet weather and most packs turn my back into a steam room on long climbs. Also, with oddly shaped or lumpy items in the pack, the back panel on some packs deforms and can be very uncomfortable on long rides. 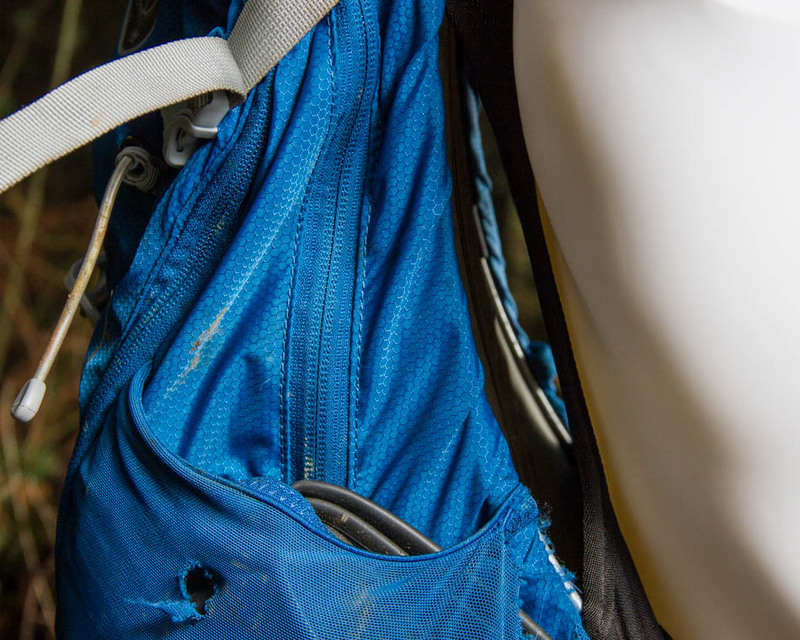 Osprey took note of these issues and equipped the Syncro 15 with a suspension mesh panel that keeps the back panel of the pack away and off your back, allowing for increased air flow and comfort. I will go so far as to say the Syncro 15 is quite possibly the most comfortable riding pack I've ever worn. The mesh panel conforms around my shoulder blades and spine, making for a seemingly custom fit. My movement has never been impeded and the pack has not caused any back or shoulder pain on long rides. It certainly vents better than any pack I've worn before. It’s not as good as riding without a pack, but is definitely superior to most designs. The Syncro 15 isn’t cheap at $120, but that price is comparable to a lot of other packs in this class. It will easily hold all your gear for pretty much any day ride, whether it's blue-bird skies or pouring cats and dogs, and, with a scant weight of about 1.25 pounds, you'll have no one to blame but yourself for a heavy pack.